The yearly report from the Texas Association of Realtors shows that there has been a steady stream of out-of-state migration to Texas cities. Yearly, Texas is gaining more than 500,000 new residents. Of those new residents, the majority are moving to the Dallas-Fort Worth area. Some estimate that the Fort Worth area is gaining more than 200 residents per day. It is ranked as one of America’s most livable cities. The reasons for this mass migration are numerous. The excellent quality of life in the Fort Worth area cannot be attributed to any one thing. We have compiled five of the top reasons why so many families, professionals, and corporations are finding themselves drawn to this amazing region. Culture: The culture of the Fort Worth area is not one of a giant urban conglomerate of asphalt and steel. This area is a collection of small towns and neighborhoods. The suburbs, the downtown areas, the historic districts, and the professional districts are not separate, disconnected entities. They function as a whole, living organism. And this is quite an accomplishment. 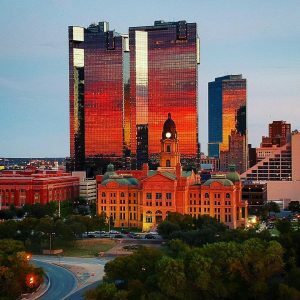 It is no small thing to achieve a cohesive mix of cowboy culture and city life, but Fort Worth pulls it off beautifully. Even as it remains “The city where the West begins,” this metro area also includes a booming tech industry and more. Cost of Living: Even with its growth and popularity, the cost of living in Fort Worth is nearly 14 percent below the national average. It’s also a seller’s market in Fort Worth, with the median home price just over $200,000. With the oil industry, transportation costs are much lower than the national average, which also keeps other costs low, such as utilities and groceries. Jobs: The Dallas-Fort Worth metroplex ranks among the top five in the nation for corporation headquarters of Fortune 500 companies. Fort Worth is home to national and international corporations and has a global presence in commerce. is the city is home to more than 80,000 businesses, including corporate giants, such as GE, Lockheed Martin, AT&T, and American Airlines. The city has so many employment opportunities, that it is regularly ranked in the top cities for job seekers. The unemployment rate is well below the national average. Places: Fort Worth offers a treasure trove of places to explore. Sundance Square is one of the top downtown areas in the country. It offers 35 blocks of boutique shopping, unique dining, live music and movies, and gathering areas. The Cultural District in Fort Worth is home to six world-class museums and is known as the museum capital of the Southwest. The Fort Worth Zoo, ranked by USA Today’s best zoos survey as #4, has more than 7,000 native and exotic animals and is a major attraction in the area. Food: Without a doubt, one of the best things about the Southwest in general and about Fort Worth in particular, is the amazing food. Everywhere you turn there’s something delicious on the menu, from Tex-Mex to pizza. From fine dining to food trucks, there is never a lack of options for food lovers in Fort Worth. Fort Worth Bargain Storage – West: located near the I-820 and North Z Boaz Park in west Fort Worth. Fort Worth Bargain Storage – Eastchase: located near the Waterchase Golf Club and I-30 in east Fort Worth. Fort Worth Bargain Storage – East: located in the Handley area near Lake Arlington and I-820. All three facilities offer large and small drive-up storage units, wide drive aisles for convenient access and a clean, newly renovated facility all at affordable rates. In addition, you’ll love the RV and boat parking spaces we have at our property near Lake Arlington. As always, you’ll receive some of the friendliest service from our knowledgeable team members. Regardless of your self-storage needs, there is a Bargain Storage facility that can help make your transition to Fort Worth a smooth one. We invite you to contact us today to learn about our facilities and their offerings.